Can you believe we are only a week away from Christmas? Crazy! Have you managed to get all your Christmas shopping done? Being the crazy planner and list maker that I am, I have managed to shop, wrap and tag all my Christmas presents ready for next Sunday. I am now officially on holidays and am really looking forward to our Tassie trip after Christmas. During the next week, I will be crazily preparing and cooking ready for Sunday, as Pete and I are hosting Christmas at our place. Fingers crossed it all works out, I have a fun menu planned. One thing that we have already stocked up on ready for the big day is CIDER. 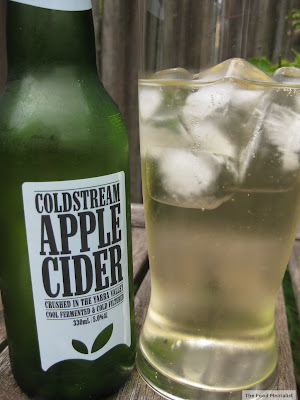 I chose an Aussie cider for this weeks edition of Cider Sunday : Coldstream Apple Cider. I haven't noticed too many Aussie ones on the market so I thought it would be good choice. I must admit I was very sceptical at first because so far the Swedes appear to have cornered the market when it comes to exceptional cider. However, with this one I was pleasantly surprised. I actually really like this cider. It's a refreshing drop made by Coldstream Brewery in the Yarra Valley in Victoria. The cider is made using local apples crushed using a 'rack and cloth' press method. It's also cold fermented and filtered too which helps make sure it keeps it's crisp apple flavour. The cider itself is a pale golden colour and has a crisp apple flavour with a few spicy notes. As far as ciders go, this one is straight forward & simple apple cider. It has a nice apple flavour and balanced sweetness. This cider will pair well with most summer foods, why not add a few bottles to your Christmas table? 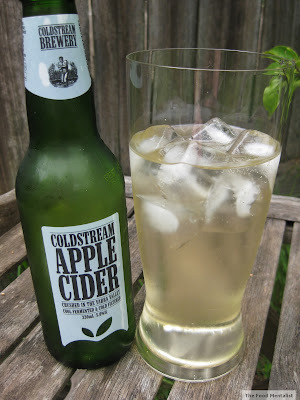 A 330ml bottle of Coldstream Apple Cider equals 1.3 standard drinks at 5% alcohol. RRP $3.50 per 330ml bottle or $16.90 per pack of 4. $54.90 per case of 24. I hope you have a great week and Christmas - Next Sunday, I have a special Christmas Cider for you all to try. just tasted that cider last night for the first time. Its Awesome! !